Shibori is the Japanese term (from the word meaning "to squeeze or wring") for the dye-resist technique of binding, clamping, or gathering the cloth so that the dye cannot reach certain parts. The result is the most powerful of combinations a carefully structured design with the organic freedom of the unpredictable. One of the richest textile traditions in the world, shibori has been used in Japan, Africa, India, and South America for centuries to create vibrant color, bold patterns, and intricate motifs. In recent years, a resurgence of the art has revealed its full potential. Janice Gunner's book is aimed at quilters, embroiderers, and textile artists who want to master the techniques of shibori and find ways to use the fabric for a range of textile applications. 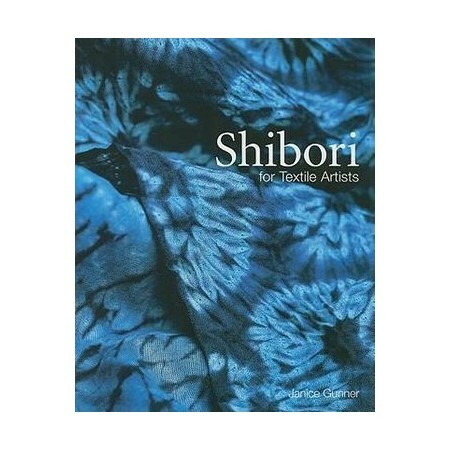 The book begins with the historical and cultural background of shibori; then goes on to explain, with clear, step-by-step instructions and diagrams, how to make a wide range of exquisite fabrics. Gunner covers many different techniques, including tied-resist, stitched-resist, wrapped-resist, clamp-resist, folded-and pleated-resist, as well as immersion, space and indigo dyeing. Stunning examples of finished shibori pieces appear throughout the book, both to inspire and guide; and practical advice is given on incorporating shibori textiles into the reader's own quilted and embroidered work.